This photo was taken about four years ago. My daughter (then six) wanted to learn how to high jump. 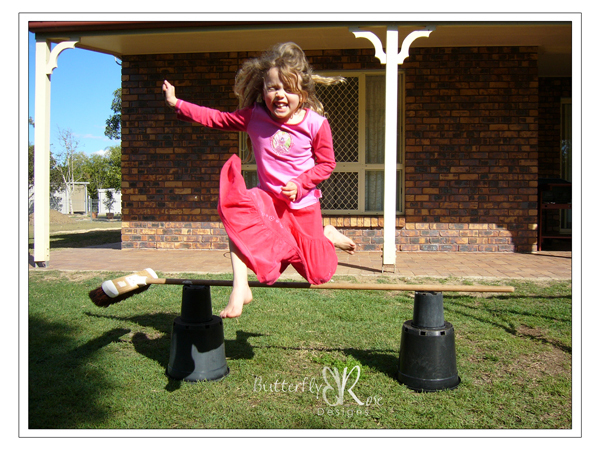 So we searched around the backyard and found a couple of pots for the base, a broom for the bar and we had made our very own high jump. It was a great afternoon as you can tell from the smile on her face. I love the expression on her face. A little bit of excitement, a tine bit of fear and a whole lot of fun. How fun!!! I LOVE the look on her face! very cool! I love her face! I love that her eyes are tightly shut in this one. Wheeee!